Trine Hahnemann’s book, Scandinavian Baking, passed briefly through my hands a while back. There were many gorgeous recipes which all seemed to contain some of my favourite indulgences including marzipan, cream and chocolate. Needless to say, I’m very tempted to buy the book. However, I did take note of one recipe that caught my eye as it uses rye bread instead of flour. As some of you may know, I make rye sourdough bread on a regular basis, so this Scandinavian chocolate cake seemed particularly apt. The recipe also included blackcurrant jam and as I still have a few jars of the chilli blackcurrant jam I made last summer, this seemed like a good opportunity to use some of it. Other than scaling down the quantities to make a smaller cake, using my chilli blackcurrant jam, swapping the hazelnuts for Brazil nuts and a few other tweaks, I pretty much stuck to the recipe – haha! The rye bread and blackcurrant cake was surprisingly light given the ingredients used. It was also nicely chewy. All by itself it would be a good cake, but the added jam, cream and chocolate changed it into a bit of a marvel. The cream cooled the slight heat coming from the chillies in the jam and the chocolate added a little sophistication. Rich, indulgent but also quite simple, this was even better than I was hoping. Now I know I can use rye bread to make cakes, I’ll no longer have those annoying bits of stale bread left at the end of the loaf. This Scandinavian chocolate cake, otherwise known as Brødtort, comes from a region in Denmark where the tradition of cake tables almost puts our Clandestine Cake Club to shame. Invitees are expected to try a bit of every cake at a buffet consisting of at least twenty cakes. I think my record is about nine at one of our CCC gatherings and that was quite tough going. 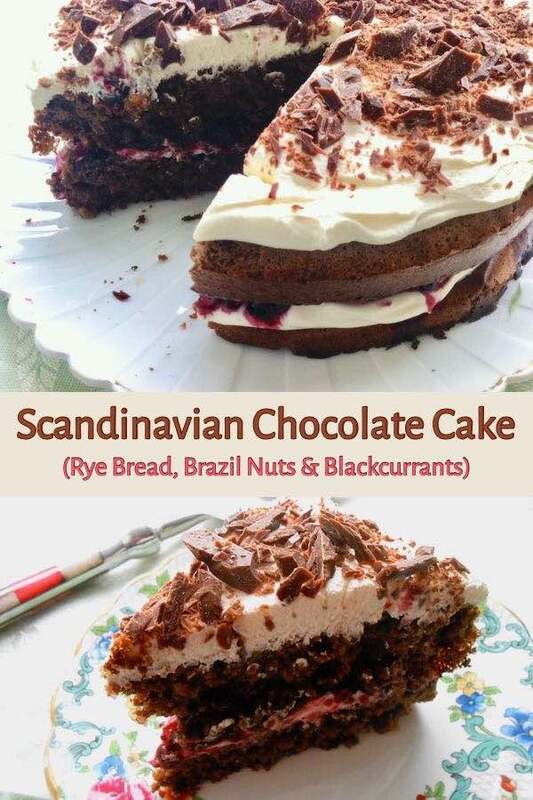 A surprisingly light Scandinavian chocolate cake made with rye breadcrumbs & Brazil nuts, then sandwiched together with blackcurrant jam & cream. 30 g G&B milk chocolate - chopped into small pieces. Whizz the rye bread in a coffee grinder or food processor to create breadcrumbs. Similarly grind the Brazil nuts. Mix these together with the cocoa powder and baking powder. Add the sugar to the yolks and beat with an electric whisk for a few minutes until the mixture is thick and pale. Fold in the bread crumb mixture until just combined. Whisk the egg whites with clean beaters until stiff, then fold into the cake mixture as gently as possible. Spoon into two 20 cm (8") silicon cake moulds or lined tins and bake for 7 minutes at 200℃.Turn the oven down to 180℃ and baked for a further 8 minutes or until an inserted skewer comes out clean. Remove from the oven and leave to cool for for ten minutes before turning out onto a wire rack to cool completely. Whip 150ml double cream until it holds its shape, but isn't stiff. Cover one cake with half the cream then blob the blackcurrant chilli jam over the top with a teaspoon. Place the second cake on top and spread this with the remaining cream. Scatter the chocolate over the top. I am sending this Scandinavian chocolate cake off to a brand new challenge created by Janice over at Farmersgirl Kitchen. #RecipeClippings gives us the incentive to trawl through our piles of magazine clippings, torn out recipes and hand written notes and then actually use them. A grand idea I reckon. In the same vein, I am sending my rye bread and blackcurrant cake off to Bookmarked Recipes with Jac of Tinned Tomatoes. The recipe called for hazelnuts, but when I went to find them in my cupboard I came across a packet of Brazil nuts which were past their sell by date. So I thought I’d better use those instead. This makes it eligible for the No Waste Food Challenge over at Elizabeth’s Kitchen Diary. 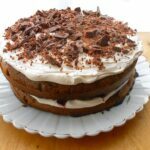 If you make this Scandinavian chocolate cake recipe, I’d love to hear about it or see a photo. For more nutritious and delicious recipes, follow me on Twitter, Facebook, Instagram or Pinterest. Scandinavian Chocolate Cake. PIN IT. Oh my goodness that looks tasty! 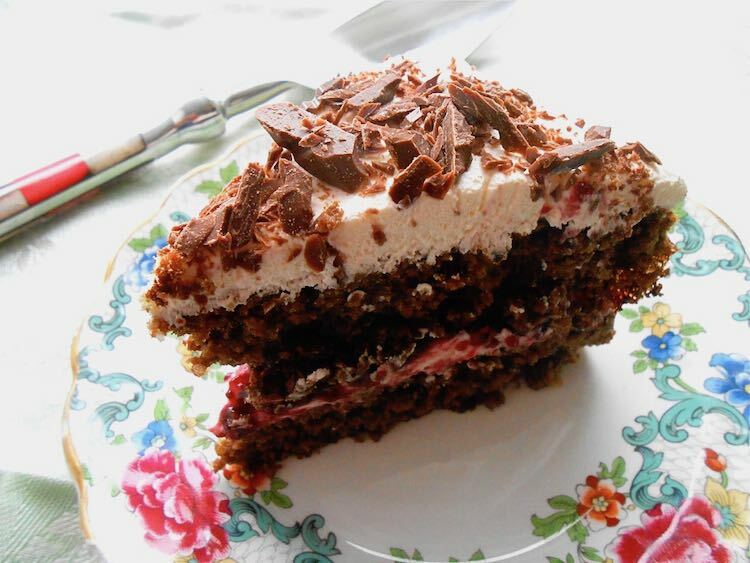 It almost looks like a Blackforest Gateau which I haven’t had for years. So glad you’re both feeling better, I reckon you’ve both had your annual quota in one hit! That’s very generous of you to say so Janie – I thought you might have run screaming with all that cream! It is very tasty though. And yes, hooray, we are both feeling better and hopefully won’t get anything else again this year!!! If this is a scaled down version, how big was the original?!! It looks and sounds delicious! Yes indeed Suelle, this is why I scaled it down by 2/3. The original used six eggs and 23 cm cake tins. Delicious recipe! I am still having treats occasionally. I could never be on a diet just because it is January, I just eat less..whenever I can. In any case this cakes looks lovely and I would have a slice at any time.. whether is January, August or December. Thanks Steph, that’s very kind. I look forward to your returning with more fab comments 🙂 I’m seriously thinking I’m going to have to get that book. I never came across a cake with rye bread in it but this sounds wonderful! I so enjoy trying out something a little different, often the results can surprise you and this cake was really good. What a fab idea. While I don’t have homebaked rye bread around, do you reckon a shop variety would do, like Borodinsky bread? I’m sure bought rye bread will be fine Galina. The recipe didn’t specifically say to use homemade, although she did suggest her own recipe for rye bread – of course! Thank you! I don’t think I ever baked my own rye bread. One day! I don’t think I have ever seen a cake made with breadcrumbs. Sounds really interesting. Is the texture very different to usual cake? Great use for that jam too! Glad to hear you are better! That looks lush and just what you need now you are feeling better to perk up your spirit. Never heard of rye bread in cake before. Unusual! Thanks Jac. It’s a very unusual cake, but a very nice one. Thank you Deena 🙂 This was a new one on me too, but I shall be experimenting further with this now I know how well it works. It was yummy indeed Michelle. Do you mean you don’t always love cake??? Golly, this is such a pretty cake to look at! All that creamy filling makes it all the more inviting! Laughing at your challenge use of the ‘wrong nuts’. Looks lovely though! Your cake looks and sounds girgeous! I love the flavour of rye bread so I will bookmark this recipe for future leftovers, it’s a great idea that I feel almost compelled to try! Do try it Jean, would love to know how you find it. I was really pleased with the plate – 99p in a local charity shop I think. you must be better indeed, this is a stunning cake. I love what you’ve done with the rye, it’s so intriguing!… and so perfectly naughty… this could be a picture from the summer! Isn’t it good to have something like this in the depths of winter Dom – reminds us of summers gone and summers yet to be. That looks spectacular Choclette! When I first saw it I thought you meant you had used rye bread flour but now I read it properly I see you have used actual rye bread – a genius idea for using up the end of a loaf. Brilliant! I feel rather pleased with this idea too Vohn – not of course that it’s mine. I do sometimes use rye flour in cakes and it works very well too, but this is more fun. I’m all for a bit of January indulgence and this would fit the bill very well indeed. Whenever I make rye bread there tends to be some left (no idea why, maybe it’s a comment on my bread making) so this is definitely something to remember. Holy cow that looks (and sounds) amazing! Good to hear you’re feeling much better- what a rotten time of year to have both been unwell. Like Phil, I’m also definitely all for a little January indulgence and this beautiful cake certainly hits the spot! you have me , this is delicious, when you moving in with me to make me some lol, its my most loved cake yummy. For all of us chocolate lovers, this seems like a perfect cake! I’m curious to try making one! Would love to know what you think. If you do make it, let me know. My gosh, how very creative Choclette. We are gonna have fun with this one. Thanks Bintu. It really was fun, would never have thought it would work so well. Isn’t it just Elizabeth. I was really pleased how well this turned out. I have bookmarked it to try soon after I get back to OZ. I leave SF tomorrow. Sounds delicious. Sorry – didn’t know you were sick! Hope you have a good time and do give my love to everyone. We were sick when my mother was visiting you in OZ, so nothing recent. We had no Christmas that year.